When it comes to tamper evident, security packaging, there’s no room for compromise. 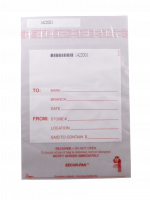 At Connover Packaging, we design, manufacture, and distribute a wide array of tamper evident cash deposit, evidence and other bags for financial institutions, retailers, churches, restaurants, law enforcement, payroll firms and other clients. All bags are manufactured in accordance with Federal Reserve Bank guidelines. In addition to our secure packaging, we pride ourselves in being a single-source distributor, offering deposit slips and a range of specialty items. We focus on both innovation and meeting your exact specifications with state-of-the-art SECUR-PAK technology. To learn more about our wide range of products, browse our catalog below or contact us today for a quote.